MANILA, Philippines- After seeing viral photos of Mayor Rodrigo Duterte wearing worn-out shoes, a netizen decided to give the presidential aspirant a gift that he’ll find very useful. 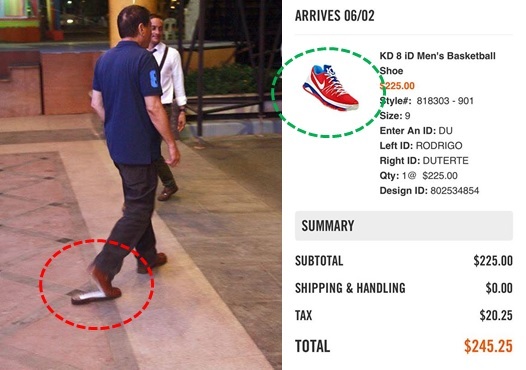 Netizen Leno Monteclaro Cupay ordered a customized Nike shoes for the outspoken mayor of Davao City online. Cupay chose the colors of the Philippine flag, which is apparently the PDP-Laban standard bearer's favorite. The words “Rodrigo” and “Du” will be etched on the left pair, while “Duterte” and “30” will be imprinted on the right pair. The pair of kicks, which is expected to be delivered on June 2, costs $225. Known for wearing simple clothes, Duterte earlier urged government officials and workers to “step into his shoes” to eliminate corruption in government. In his interview with Inquirer in August 2015, the tough talking mayor said he wears unbranded shoes without socks. “I wear cheap shoes. I don’t even wear socks,” Duterte told reporters. Despite his preference for simple clothing, Duterte was accused by vice presidential candidate Senator Antonio Trillanes IV of having P211 million undeclared funds and P2.4 billion worth of deposits in his bank account at the Bank of the Philippines Islands (BPI) Julia Vargas branch. Following his face-off with Duterte’s lawyer at the BPI branch on Monday, May 2, Trillanes filed a plunder complaint against the presidential aspirate before the Office of the Ombudsan on Thursday, May 5. According to Trillanes, a scheme involving ghost employees in the government of Davao City is the potential source of the supposed P2.4 billion transactions in Duterte’s accounts.